Pa Kua is the third among the traditional internal Chinese kung fu/wushu schools. In the west, it is the style that was last to become known. Even in China this style is not considered well-known. It is the most complicated and varied of all the styles and shrouded with secrecy. There are few Pa Kua teachers, and in west, even fewer good teachers. Still the interest in this style is growing. With this article we would like to clear up some important points about this style to help those interested in learning it. This article is a result of a visit from Master T.Y Pang to the Netherlands. On the weekend of November 2 and 3, 2002, Mr. Pang gave workshops to the students of H. Eleonora in Amsterdam. In these workshops, he taught the Yang style Tai Chi as well as Pa Kua. Mr. Eleonora gives courses and workshops in Pa Kua according to the methods of Mr. Pang because he believes that these are the most authentic. Mr. Pang spoke with us about Pa Kua, sharing with us his deep understanding of this style. In Chinese terms, Pa Kua is not considered old. According to Pang, it was created in the 19th century by Dong Hai Chuang. The story tells that Dong had to flee into the mountains after having killed a man. During his wanderings in Kiangshu province by the "Snow Blossom Mountain," he learned a mystical fighting style from an old Taoist hermit. Dong used this as a foundation and developed the system that is now known as Pa Kua (literally meaning 8-triagram). But according to Pang, the style which he learned from the old Taoist was very old. The symbol of the Pa Kua/8-triagram originates from a 5000 year-old philosophical system attributed to the legendary emperor Fu Xi. This system forms the core of the I Ching, the Book of Change, and is based on the principle that everything is in constant movement and change. Everything changes continually; living beings, the earth, the universe. As human beings, we following a natural movement and flow, and strive for 'the middle' or balance. As you can see, the history and origins of Pa Kua are not that clear cut. 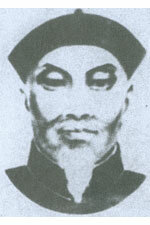 In any case though, it is true that Dong Hai Chuang arrived in Beijing with a fully developed system with which he started teaching and made Pa Kua known. Many of his students were of the elite class. Outsiders were not allowed to know about Pa Kua and thus it remained a secret martial art until well into the 20th century. Play the form as a dragon would; the dragon's movements are agile and unpredictable. Turn like a monkey; the monkey is alert, lively and attentive. Change your form like an eagle; in the air the eagle knows no limits. Be still like a tiger; the tiger waits for the right moment and explodes into action. Pa Kua is based on simplicity, there are no fixed forms. Pang learned from Sun only eight "mother forms" which are all extremely short. But these eight forms contain all movements which the human body is capable of making. The simplicity is deceiving. A lot of practice is needed to achieve skill in the movements, and this skill is necessary in the performance of Pa Kua. There should be no fixed patterns and no habits. For this reason Mr. Pang does not find it necessary to write a book about Pa Kua. He is planning to make a video so that the walking and turning can be seen clearly. Pa Kua has some unusual characteristics. First of all, there is the practice of walking the circle. The style of walking is also peculiar, known as "mud walking". You walk slowly and evenly picking each foot up carefully as though you are walking in deep mud and don't wish to splatter any on your clothes. Mr. Pang bases his training on this technique which he considers essential. When walking the circle, there are 3 different methods/steps used to change directions. Pang has named these the T-step, the L-step and the V-step, because in taking the steps required your feet form these letters. The most important are the T-step and L-step: K'ou Pu and Pai Pu. Only when you have properly trained the walking technique at a slow and relaxed pace will you be able to increase your speed. Moving slowly is the foundation to develop muscles which are generally weak. Only then can one have the speed to move quickly. Because of this and because of the unpredictable turning in this style, it is possible to defend against attacks from every direction, while being oneself almost impossible to catch. With each step, the feet must grasp the ground. The knees are bent, your power comes from the legs. Your upper body must be light, the chest 'empty.' It is essential that the turns you make come from the waist and not the hips. Another typical characteristic of Pa Kua is that the two arms constantly twist and turn in relation to each other, while the hands and palms are like the tongue of a grazing cow. Pa Kua is known as an internal system. When you practice Pa Kua your mind must be calm so that thoughts and worries disappear. When this happens there is space and freedom for inner hearing, inner seeing and inner feeling. In this way you follow the movements of your body. Slowly you let your breathing follow your movements. In the beginning it is not necessary to try to match your breathing, just breath naturally to your lower belly. Let your body relax, but not go limp. Be alert, but do not concentrate. And practice without expectations, because expectations create restlessness which destroys the inner peace. Be conscious of your movements and don't move habitually. Wu Yi Xiang (1812 - 1880), was a great wu-shu scholar and writer of many classical Tai Chi texts. The transfer of knowledge about Tai Chi was much improved due to his writings. Two of his writings were about movement, and laid down rules for training. Pang considers these writings also appropriate for Pa Kua, for although the styles differ, the fundamental principles of movement applying to both are the same.